I will have built more than 120 of these figures ! The shields are already done and the five of them are being undercoated. To the side are a couple of the old style plastic Dark Elf figures that are being kit bashed with the new plastic banners and arms from various kits. 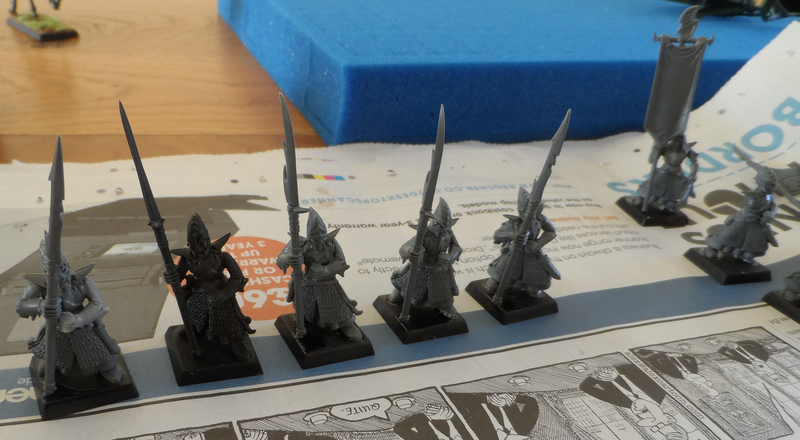 Also started are the first of the new plastic Black Guard which should rank up well, better than the old metal ones. The Dark Riders are varnished and the new foam trays delivered, so I’ll comment on storage of figures tomorrow (yay!). These are the last few things I have on the go before the builders return (Floor Wars II). The kitchen floor is due to be resurfaced, walls and woodwork repainted etc… and as a priority customer (!) the insurance company and builders aim to agree costs this week with work starting Monday.